Editor's Notes: Joe Spirito, Esq. is a founding partner of McGaughey & Spirito located in Redondo Beach, California. Joe specializes in family law and is a practitioner and instructor of collaborative divorces. He is also the current Secretary for the Los Angeles County Bar Association's Family Law Executive Committee. Personal qualities that embody the ideals of honesty, integrity, loyalty and fairness. David is only the second non-judicial officer to receive the MacFaden Award and THE FIRST EVER NON-ATTORNEY RECIPIENT. As you will hear about David’s life and career, you will understand that he is a formidable trailblazer. David was born in 1943 in the Japanese internment camp at Amache, Colorado. He was the first child born in this camp. This was the genesis of a lifelong commitment in learning how to help parents and their children get through difficult times in their lives, and caring for others. When David started college at UCLA, he thought he would eventually become a doctor, but realized he enjoyed talking and listening to people more than studying science and medicine. In 1972 David received his Masters of Social Work from USC. David was then affiliated with the USC Medical Center as well as the Children’s Hospital of Los Angeles where, as a preeminent social worker, he assisted children with developmental disabilities. David received the prestigious Field Instruction Award from the USC School of Social Work and subsequently received the National Association of Social Workers highest honor, a Lifetime Achievement Award. 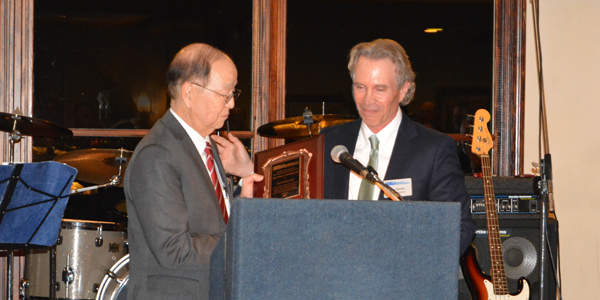 Most recently he also received the USC George Nickel Award for Professional Services. In 1981 David commenced working for the Los Angeles Superior Court as a Senior Family Mediator, successfully working his way up to become the Division Chief for Mediation and Conciliation Court Services. David’s focus was, and still is, to ensure that mediation services could be provided effectively to families going through emotionally difficult and challenging divorces. His focus has always been on successfully transitioning children through this difficult process. In 1999, after eighteen years of working with the Superior Court, David commenced private practice in divorce mediation, at which time I became a colleague and friend of his. Family law practitioners have personally witnessed the profound and positive effect he has had on families and children in our community. Judicial officials across the county also appreciate David’s role. In fact, I remember one time when a Judge appointed David as a parenting plan coordinator, the Judge told the parents that they wouldn’t need the judge anymore because David would be able to resolve the dispute. As challenging as some parents can be in mediations, I have never heard David complain or speak ill of them. He has told me that he learned from his mother a long time ago that despite flaws in people, people all have “a good heart”. For those of us who know David, we all know that he speaks with a soft voice, but that soft voice resonates powerfully. Through thoughtful words David reduces conflict and reminds people to be their best. And I’m not referring solely to his mediations, but to a myriad of organizations where strong opinions compete and a measured compromise is in order. Case-in-point, many years ago, David resigned from a Little League Board in order to help the parents remember that the focus should be on putting the kids first. David’s kindness has been liberally sprinkled around the room tonight. David’s thoughtful insight and mentorship has helped so many of us here tonight and even more who were not able to attend. In addition to assisting bench officers resolve custody disputes, David has written numerous letters to support the application of Family Law Commissioners to be elevated to Judges. David has also been instrumental in advancing collaborative practice in the State of California. The collaborative process is a consensual way of attempting to resolve family law disputes and cases. In fact, in 2006 David received the State’s Inaugural Eureka award for his contributions to collaborative practice. Most significantly, David is devoted and cares about his community. He routinely donates his time and still serves as a volunteer mediator at our Court here in Torrance. After the 2011 tsunami disaster in Japan, David did not sit idly by. He joined his church group and went to Japan to help rebuild devastated communities. David was also the person responsible for permitting associate members to be included in the South Bay Bar. David suggested this idea approximately 10 years ago as a way for non-attorneys to be able to contribute to the legal community. There are now 23 associate members, many of whom are here today, who make great contributions to our community. David’s entire family is here tonight, including his wife of 44 years, Alice. David is an extraordinary friendship matchmaker. He takes great pleasure in introducing people with the aim that each person will benefit from extending their personal and professional circle of acquaintances. By way of example, if you are lucky enough to be standing by David’s side at an event—where he is constantly being greeted by, well, everyone... you will hear him deflect all compliments, and immediately bring you into the conversation. In sum, over his professional career, David has personally provided mediation services to over 8,000 families and assisted in overseeing many thousands more. By our calculations, David has directly or indirectly helped the lives of more than over 100,000 children in our community. Nobody more perfectly embodies the spirit of the MacFaden award. Ladies and Gentlemen, Mr. David Kuroda.